Winter can be extremely harsh on your dog’s soft paw pads. 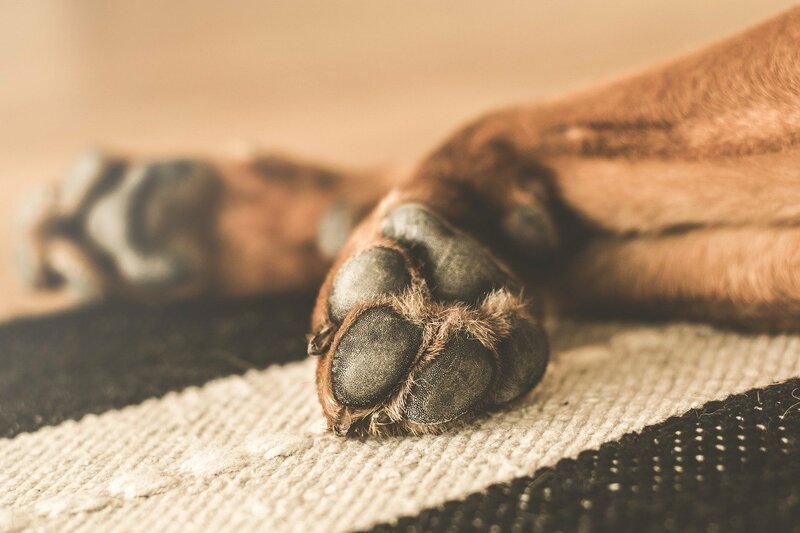 In order to protect dog’s paws, you’ll need to take a number of steps. Not only are the temperatures freezing but there are many toxic substances that your pup’s paws are exposed to such as: de-icer, salt, or other harmful chemicals that combat the snow and ice. These nasty chemicals can cause a combination of drying, cracking, frostbite and chemical burns to your dog’s sensitive puppy pads. In winter, it’s still incredibly important to keep your dog active and take them out for exercise — but unfortunately, not all of us live in a warm climate year-round. 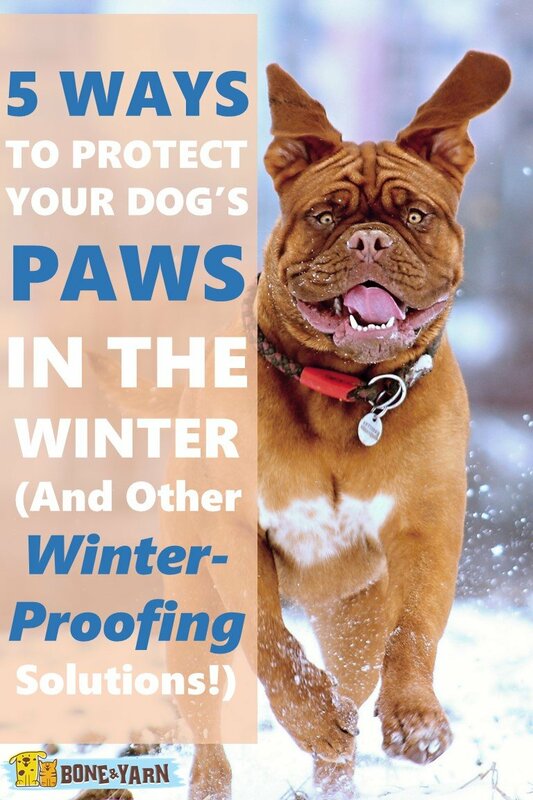 So, what can you do to make sure your dog’s paws stay nice and healthy even in the midst of the chilly winter months? Luckily, there are several things you can do to prevent injury or harm to their paws! We’ve listed them for you, below. There are many paw balms and waxes on the market to protect dog’s paws. It’s important when looking to purchase one that you study the ingredient list. Our favorite one we’ve come across is QualityPet’s Paw Nectar. It uses 100% natural and organic ingredients like coconut oil, avocado oil, beeswax, shea butter, cocoa butter, and vitamin E — so even if your dog tries to lick its paws (which it will) this formula won’t cause them any harm. Plus, it’s safe for humans, too — and the rosemary seed extract and lavender oil provides a very subtle, soothing scent. Prep the paws by making sure your dog’s fur is trimmed — this is especially important for long-haired dogs. A good rule of thumb is to make sure the hair is even with the paw pad. A beard trimmer with a guard works perfectly for this task. If the hair is too long it can make contact with the ground which can cause painful and traumatic ice balls to form. Apply a thin layer of the balm of your choice to the bottom of their pads just before going out for a winter walk. After the walk, be sure to wipe down your dog’s paws with a warm washcloth to remove any snow, ice, or chemicals they may have come into contact with. Re-apply another thin layer of balm to soothe their paws, prevent any irritation, and keep them from becoming too dry. Although they might look silly, dog boots or socks are a great way to protect dog’s paws from the winter elements. There are countless brands and types of boots out there for you to choose from. They’re great because they provide protection that dog paws cannot accomplish on their own. The boots protect from salt, prevent ice balls, keep their paws dry and they also prevent your dog from getting cut from sharp ice or any sharp objects that might be under the snow. If you’re looking to go the doggie boot route, it’s important that your dog’s boots are sized properly. This will ensure that they are comfortable for your dog to wear and that they will properly protect their paws. Be sure that the boot strap is snug but not too tight — you don’t want them falling off mid-run but you also don’t want them constricting the paw. Just as a child might hate wearing their snowsuit, your dog might not be fan of wearing the boots at first. It could take a little time and patience on your part to get your dog trained to love (or at least tolerate) wearing their new snow shoes. Start with putting them on for short periods of time around the house. After a job well done, praise or reward them and continue to increase the amount of time until they’re used to wearing them. Gently grab your dog’s paw in your hand to visually inspect for anything abnormal such as cuts, scrapes, or any cracking. Press down gently on their paw to take notice of your dog’s response and reaction. If they respond with a wince of pain or discomfort, they may need to stay off their paws for a bit or you may have to cut their walks a bit shorter. Don’t forget to check in between their toes! Keep an eye out for any cuts, lumps, or discoloration. It’s absolutely crucial to pay attention to these tiny details on your pup’s feet to keep them healthy. Maintaining proper paw health can’t be stressed enough — especially during frosty winter months. If you live in an area that makes your home prone to slippery driveways or porches — consider using non-toxic ice melters (like Safe Paw Non-Toxic Ice Melter) instead of salt or other harsh chemicals. Using a non-toxic ice melter will prevent any chemical burns or severe drying of your dog’s paws. It’s also safe for kids, plants/vegetation, and stonework. Just like us humans — our fur babies are susceptible to hypothermia and frostbite if they’re in the cold for too long. 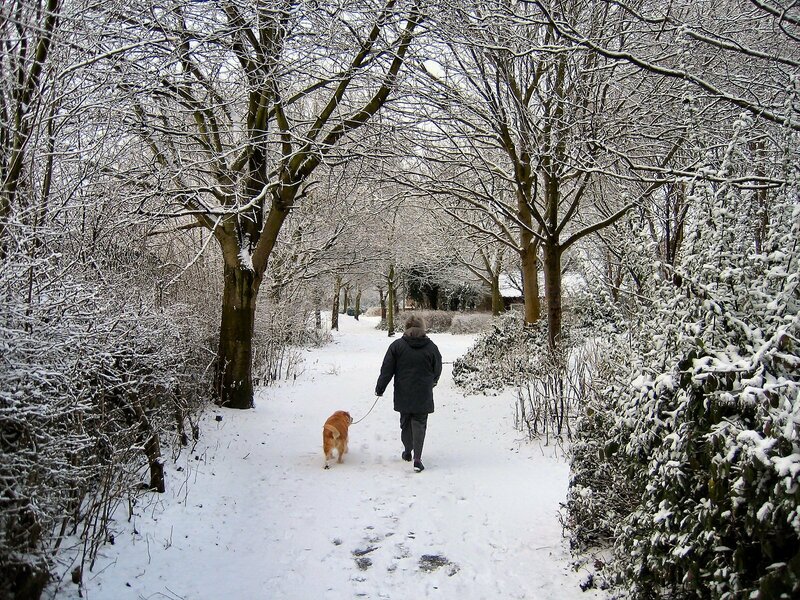 During colder months, take short and frequent walks rather than a one-time drawn out walk exposing them to the elements. Not to mention — you probably don’t want to be outside for too long, either! Regardless of the breed, try and keep cold exposure to a minimum — especially when temps are below freezing. If you’re ready to go inside, keep in mind they probably are too. During the winter your dog might not be as active as they are in the warmer months. Be aware of your dog’s activity level and adjust their calorie intake accordingly. Lazier or less active behavior might mean that they need less food. An extra layer of fat is not a good way to keep them warmer during the chilly season! Don’t let your pooch sleep on a cold hard floor during the winter. Raised beds and/or warm insulated bedding is vital to keeping your dog at a nice warm temperature during those cold nights. Make sure your dog’s sleeping spot is away from any cold drafts, cold tile, or concrete floors. It’s ideal if they sleep in a consistent spot each night so that they don’t get uncomfortable or anxious if moved to an unfamiliar area. If it’s at all possible, try and time your walks in the late morning or early afternoon — temperatures are generally at their highest during these times. Early morning or late night walks can be the most chilly (for you and for them)! If you see that the sun has made an appearance — take advantage of it and get outside! The sunshine will make it a bit more tolerable to be outdoors plus it will give you and your dog the added bonus of a vitamin D boost! Win, win! You know how the dry cold winter weather can wreak havoc on your skin? It does the same thing to your dog’s skin as well. Their skin can become dry, flaky, and irritated but it is easily prevented (and treated) by adding a supplement to their food. Coconut oil is a wonderful and natural ingredient to add to their food for healthy skin and a shiny coat. 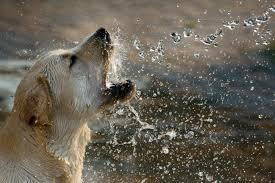 Just because it’s cold and wet outside doesn’t mean that your dog won’t get as dehydrated as they might in the hot summer months. Eating snow doesn’t count as proper hydration, either! Make sure your dog has constant access to a fresh water bowl and be sure to break any ice that might form on top if the bowl is kept outside for access while playing. Winter brings all sorts of toxins out of the woodwork. Antifreeze is by far the most deadly (and common) of them all. Antifreeze has a sweet taste and dogs will be tempted to lick or drink it if they come into contact with this nasty chemical. A small amount could potentially be fatal. Keep an eye out of your dog’s whereabouts at all times, making sure they stay out of the garage or off the driveway where antifreeze might be present. Your dog will most likely seek the warmest spot in the house to curl up and get comfy but it’s important to make sure they don’t get too close to heating sources. Space heaters can be a big culprit in causing burns on your dog — there’s also potential for your dog to accidentally knock the heater over causing a fire hazard. Installing baseboard radiator covers is another great way to prevent any painful burns. Be sure to pet-proof your fireplace as well! Maintaining a proper grooming regimen during the winter is crucial. If grooming is neglected during this frosty season your dog might be susceptible to matted fur or skin infections. Make sure you bathe your dog regularly and brush their coat often — this will ensure their skin stays supple and healthy and keeps their coat nice and shiny! This rule, of course, applies to every season of the year. Most people only think of leaving their dog in their car as dangerous during the hot summer months, however, freezing temperatures are just as deadly. Leaving your car running is not an option either as there is the potential for carbon-monoxide poisoning if the car is parked in a garage. It’s best to just leave your dog at home when you need to run a few errands. Another similarity that dogs have with humans is that cold weather can aggravate certain medical conditions; most noticeable arthritis. Of course keeping your senior dog active is a great way to maintain their health, however, there are certain things you should be particularly aware of during the winter season. Be mindful of slippery surfaces when walking your senior dog and provide them with a warm comfy place to rest afterwards — they might require a bit extra cushioning than a younger dog. A joint supplement is a great way to lubricate their joints and help ease any discomfort that their arthritis might cause. If you’re not giving your senior dog a joint supplement on a regular basis — you might want to consider it during the winter months. Just like us — our dogs are more susceptible illnesses and sicknesses during the winter. In short, pay special attention to your fur baby during the winter — a little extra care here and there can go a long way in keeping them happy and healthy. Ice, snow, frigid temperatures and the freezing cold can quickly turn hazardous for your dog. Winter is jam-packed with fun cold-weather activities, so go out and enjoy them with your furry soulmate! Just make sure to take extra precautions in keeping them safe. Following our tips and advice is the perfect way to do just that. And don’t forget, a nice cuddle session is a wonderful way to keep you and your dog nice and toasty. Then, soon enough, it will be spring!